Bleachaholic? A Cosmetic Dentist in Hutchinson Can Help! There are hundreds of thousands of ads that will “show you how to improve your appearance.” In many cases, they’re trying to sell you a product (that most likely doesn’t work that well) that can promise you the gorgeous look that you’ve always wanted, like sparkling white teeth with whitening strips. If you really want whiter teeth, you should trust a cosmetic dentist in Hutchinson before an infomercial or your favorite Instagram influencer. Not only can you avoid wasted time and money, but you won’t have to deal with the side effects of teeth whitening alone. Continue reading to learn more. A “bleachaholic” is a patient who’s become obsessed with using bleaching products to whiten their teeth—to the point where they could be damaging their teeth and gums. Too much bleaching at home can cause you to have negative effects on the teeth and even your soft tissues. It’s easy to become a “bleachaholic” because the products seem initially weak and actually don’t give you the results you want in the beginning. That’s why it’s just best to trust a professional dentist in Hutchinson for your true, safe whitening results. True results—up to 8 shades lighter and whiter teeth. A safely monitored whitening session. Special accommodations for existing oral conditions, like tooth sensitivity. Results that will last much longer than over the counter products. When you use whitening products on your own, you have to figure everything out by yourself—even the annoying, twinging tooth sensitivity that usually comes with stronger whitening products. If you choose to visit a dentist for your whitening, you’ll be fully prepared for the whole process and properly informed during your cosmetic consultation. You’ll know what the whitening appointment consists of, how to maintain your whitening results at home (what foods and drinks to avoid), and even can prepare for the brief moment of sensitivity that comes with dramatically whitening your teeth. 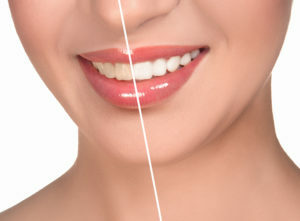 If you’re considering whitening your teeth, then get it done professionally. The results are far better and last longer—plus your dentist is a partner that’s committed to achieving your desired results. Dr. Grant Ringler is one of the most well-known cosmetic dentists in the Hutchinson area, improving countless smiles since he’s been serving the local community. One of the things that you’ll learn when you visit us is that Dr. Ringler always puts his patient’s safety first and communicates with you about what to expect before, during, and after your dental care. This even goes for simple treatments like teeth whitening! Contact us today to get started. Comments Off on Bleachaholic? A Cosmetic Dentist in Hutchinson Can Help!